Baba Virsa Singh has a very simple approach to development. Work hard, thank God, and share whatever you have with those in need. This is a legacy he has not only inherited from the Sikh Gurus and other great spiritual beings before him, but one that he personally lives. Eradicating poverty – not just helping the poor. Growing up in a poor farming family, Babaji still considers himself a farmer. His focus has always been on developing land which others deem too worthless to cultivate. He started in 1968 on 7 acres of rocky land on the outskirts of Delhi, plowing behind a team of bulls, a scene that has now become central to Gobind Sadan’s logos. 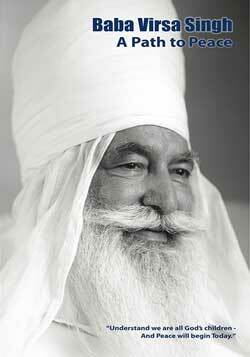 For Babaji hard work was a basic mandate to accompany his life of prayer. Once the land became productive, Babaji was able to sell small pieces of the appreciated property and raise money to take on even more challenging areas. He was able to buy land very cheaply in areas that were considered too dangerous or worthless. The only enterprises in the area were stealing and mugging. No one dared venture into them let alone could they dream that the land could ever be farmed. But once reclaimed, the land, with God’s grace has produced such bountiful crops that not only does the value of the area go up, but the income supports whatever infrastructure and services are required, schools, medical clinics, feeding thousands in need, and the prayer sites. Once Babaji began to develop the area, officials would come and marvel at the transformation. While Babaji did not take government aid for the projects, when asked what they could do to help, he would encourage them to bring the infrastructure into the area. So by his very presence, roads, electricity and bus service are now available throughout. He took unemployed young men who might otherwise have gotten in trouble if left to their own devices, and said to them, “Here’s a tractor. If you want to do something for your country, see how much food you can produce.” They became so motivated that they would compete among each other to see how long they could plow without stopping. The record still stands at more than 24 hours. He inspired such a work ethic that anyone who came to see the project immediately asked where they could get such dedicated workers. So an informal system of job readiness (employability training) and placement began. When the boys had proven their worth, they would be asked where they would like to work, in a private company, police, or army, or any other line. These poor young men who would never have risen in life, as they couldn’t afford the bribes necessary to buy their way out of poverty, now had a clear path to success. Many of them have risen to high posts. To manage the farms, he would break the boys into groups and alot specific acreage to them. The young supervisors would spend all day checking progress at different sites. One of the managers was fabled to even sleep on his motorcycle. Once when asked by organizers to attend a conference in Africa to speak on his success in overcoming poverty, Babaji responded, “I’m too busy working to attend the conference. But find me some land in the most desolate, strife-torn area and give me two years and I will develop it. Then we can hold the meeting there and I’ll show everyone how it is done.” As of yet the offer still stands. Today where once there was nothing but wild ravines, 15 feet of flood waters, and alkaline soil, the wheat, rice and sugar cane stretch across the horizon. The farm has not only brought overall economic growth to a previously backward region, but the crime and communal strife has all but disappeared. For Babaji, this is a simple path to peace. Overcome the poverty, overcome the religious and communal strife, teach people how to control their anger through meditation and prayer, and to live together as one human family, and peace will emerge.